For us, just as a general note, proximity is key. We naturally gravitate toward things (parks, restaurants, stores, etc.) because they are geographically close. Lazy? Maybe. But I like to think the reason is more because we like to live local. We heard wonderful things about the wildly popular Goldfish Swim School (located out on 28th Street and Cascade - a good 15 to 20 minute drive for us depending on traffic) but we decided to check out our local swimming pool at Wealthy Elementary instead. 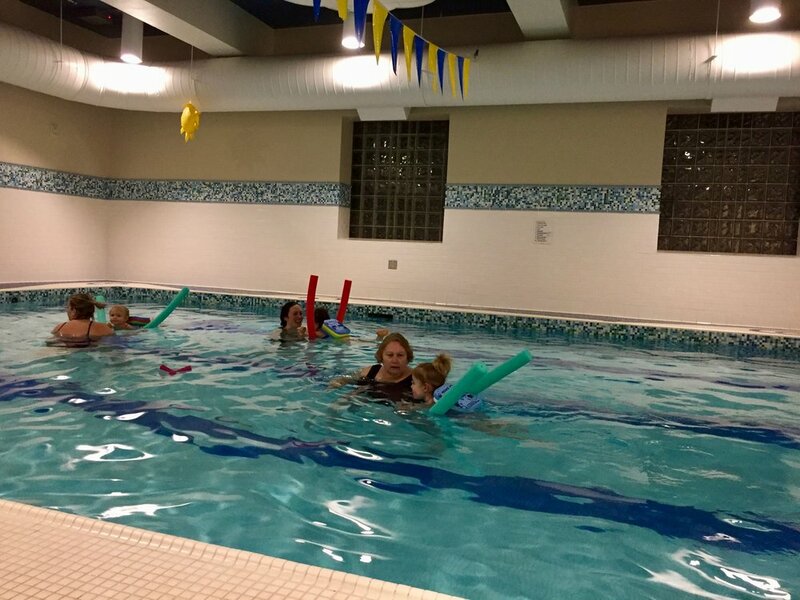 Wealthy Pool offers both private lessons as well as group classes for learning to swim. And Natalie has done both! Last Spring we signed her up for private lessons with Miss Barb (one of the 3 instructors on staff there) for a series of 30 minute sessions. At that time Natalie had just turned 2-years-old and the lessons were focused more on getting to know the water and splashing around. Miss Barb was warm and inviting and made Natalie's first swim lesson experience a good one. I could tell immediately that she was a seasoned instructor and works very well with children. Private lessons are $29 a session for residents (those who live in the East Grand Rapids City limits) and $39 for non-residents. Natalie's lessons were one on one (just her and Barb) and they had the entire pool to themselves. I watched from a chair off to the side. We also got to chose our time (8:45am on Wednesdays) based off the instructors availability. They were flexible and easy to schedule. To make private swim class arrangements at Wealthy Pool call or email Director Betsy Granstra (bgranstra@eastgr.org # 616-949-1750). And this winter Natalie and I signed up for their Monday night parent-child group swim lesson. For 5 weeks/sessions the cost was $48 for residents ($63 for non-residents) and lasted for 30 mins each time. The group lessons included instruction on how to get in and out of the pool properly, signing/games and learning the basics of swim form. I was in the pool with Natalie which was a fun thing to do together. Overall, our experience at Wealthy Pool was excellent. Not only is it 2 minutes from our house and much cheaper in comparison to other swim classes, but the staff and their programs are high quality. Wealthy Pool is a warm water pool and they keep their temps between 86-87 degrees. Parking is super easy and located on the NW side of Wealthy Elementary School. They have family locker rooms as well as separate Womens and Mens locker rooms that include showers and suit drying machines. There is also an observation room if you'd rather sit outside of the closed in pool space off to the side. i.e. if you have a toddler with you who you'd rather not walk into the pool like their sibling swims.